Learn about Philadelphia’s thriving brewery and distillery scene, tasting up to 12 beers or local spirits on this guided tour. See how beer is made and chat with brewery owners about their operations. Visit some of Philly's most popular breweries and distilleries, including the Philadelphia Brewing Company and the Dock Street Brewery, to name a couple possibilities. Round-trip transportation by passenger van is included. Get to know Philadelphia’s thriving beer scene on this guided brew tour. Chat with brewery owners and learn about the equipment used to make beer, the brewing process, and best of all, what up to 12 kinds of beer and local spirits taste like. On this brew tour, meet your guide in downtown Philly near Reading Market, then hop on a bus and travel to three local breweries or distilleries. Learn about the different types of beer as well as the history and specialty of each brewery. Stops may include the Flying Fish Brewing Company, the Philadelphia Brewing Company, the Lunacy Brewing Company, the Dock Street Brewery, Crime and Punishment, Yards Brewing Company, and/or Cooper River Distilling. Locations visited vary by date. 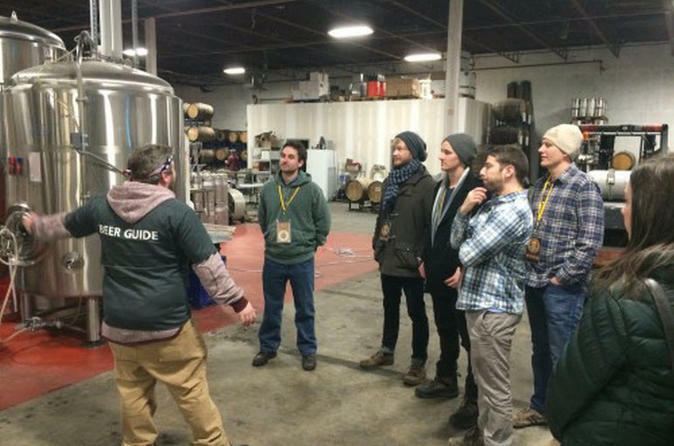 This tour combines humor, history, education, Philly pretzels, bottled water, a VIP lanyard while exploring some of Philadelphia's celebrated breweries and distilleries. Relax with roundtrip transportation and 3.5 hours of tastings on this Philly experience.